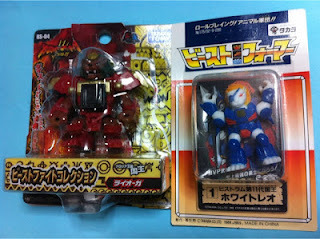 Your pal and mine Sylvain posted pictures from a guy in Japan named Syncson, which show the first-ever look at packaged Beast Saga figures next to an old-school Battle Beasts figure. At first glance the new Beast Saga lion looks larger, but if you cut him out in Photoshop and put him side-by-side with the Battle Beasts guy, the new figure seems only slightly larger. American fans, it's not yet known exactly when the importers will have theirs but it's presumably going to be pretty soon. Be sure to apologize to your wives and significant others before the credit card statements arrive in October. I've been on and off about these ever since the news hit. I've had pre-orders for several that I've canceled, re-ordered and canceled again. Now that the release is getting closer I'm starting to feel like I'll cave and at least pick up one or two for a hands on feel once they have hit online retailers.